In Women’s History, we are all too familiar with stories of brave, fierce, powerful women being excluded from the history books. Most of the stories of women and World War II pertain to their instrumental role in factories, hospitals, and communities back at home. While soldiers invaded enemy lines, Rosies the Riveter invaded the public sphere; finally, women would prove their mettle in the workplace, and they’d be forever transformed for it. But here’s a story about women and the war that adds yet another layer of complexity to our understanding of women’s roles in this era. As German air raids became more and more devastating, Radio Moscow made a general plea to its nation for new fighter pilot recruits, stating that both men AND women could serve. And serve they did. 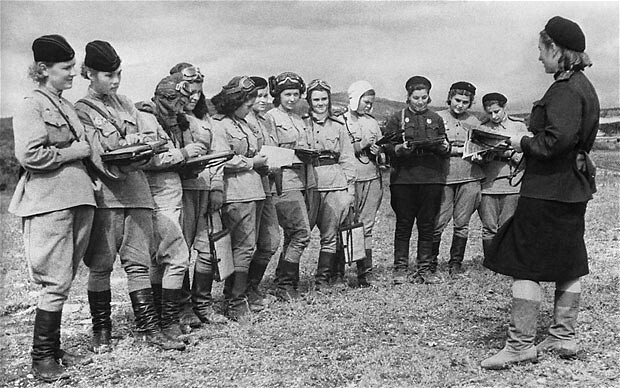 Women came in droves, from the farthest reaches of the Soviet Union. What follows is the story of a highly effective, courageous, and terrifying team of women pilots who, in groups of two, flew PO-2 bombers into German territory for surprise night raids. 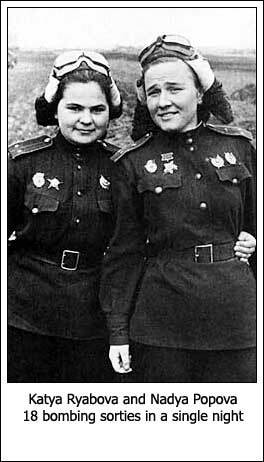 So efficacious were their raids that Germans started referring to them as “nachthexen”– night witches. Many writers find themselves drawn to Lilia Litvyak, a Soviet fighter pilot in the Second World War, who faced enormous challenges during her heroic tour of duty. Born in Moscow of Jewish descent, she joined a flying club at the age of 15, and devoured every book on aviation, Myles writes. She was such a fast learner that she flew solo on the PO-2 biplane after four hours of lessons; she later became a flight instructor. Flying under the call sign White Lily, Litvyak faced much chauvinism, her colleagues recalled. Like most women, she needed a cushion on the seat to see out of the windshield. Yet her sorties against the Germans have become the stuff of legend: the figures vary, but she is credited with up to 12 solo kills. Litvyak died in 1943 when her plane was shot down as she attacked German bombers in Ukraine. She was 21. The women of the 586th, 587th, and 588th Night Bomber Regiments dropped 3,000 tons of bombs during the course of the war, with over 23,000 sorties flown by 2-woman teams. You can read more about these heroes in historian Bruce Myles’ book, Night Witches: The untold story of Soviet women in combat. There’s also a graphic novel series based on them, entitled Battlefields.